Saturday started off with breakfast at the Westin and then to the mall in search of a baseball bat at HyperCity. No baseball bat was found but a cricket set was bought. Harrison and Bill played outside on the playground for a little while- love watching them play! We will have to research the proper way to play. 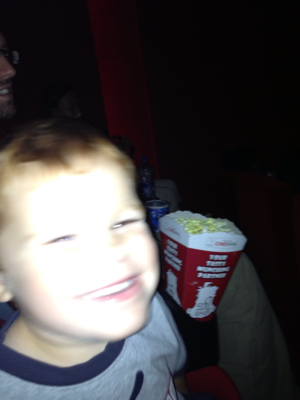 On Saturday afternoon we took Harrison to see his first movie! In India the movies tend to only last a weekend or two and if the movie is in 3D then they will only show the 3D version. So not only did Harrison see his first movie but it was also in 3D. The movie was Disney Planes, he was so excited (and popcorn was a huge hit)! Also the movie theater had intermission, so weird for a 1.5 hours movie. The 3D glasses were all one size but the engineer in Bill was able to use two of my hair ties to make them fit Harrison's head better. Saturday night we went to the Bailes house (Kate made us dinner) where Harrison was introduced to Peter Pan and Tinkerbell. It was a great Saturday! Sunday Harrison (Bill and I stayed with him) went to Sunday School for the first time. The church service is 2 hours long so they need a lot to fill the time. All the kids are gathered together before breaking into smaller age group classes. We sang songs, heard a Bible story and prayed before watching a movie (not the normal routine- we think the Sunday School teacher was absent). Looking forward to next Sunday.